We have prepared AWS Developer Associate (DVA-C01) certification sample questions to make you aware of actual exam properties. This sample question set provides you with information about the AWS-CDA exam pattern, question formate, a difficulty level of questions and time required to answer each question. 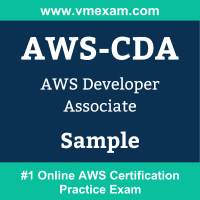 To get familiar with AWS Certified Developer - Associate exam, we suggest you try our Sample AWS DVA-C01 Certification Practice Exam in simulated AWS certification exam environment. To test your knowledge and understanding of concepts with real-time scenario based AWS DVA-C01 questions, we strongly recommend you to prepare and practice with Premium AWS-CDA Certification Practice Exam. The premium AWS-CDA certification practice exam helps you identify topics in which you are well prepared and topics in which you may need further training to achieving great score in actual AWS Certified Developer - Associate exam. 01. You have reached your account limit for the number of CloudFormation stacks in a region. How do you increase your limit? a) Use the AWS Command Line Interface. c) Use the Support Center in the AWS Management Console. d) All service limits are fixed and cannot be increased. 02. Which of the following statements about SQS is true? 03. Your application is trying to upload a 6 GB file to Simple Storage Service and receive a "Your proposed upload exceeds the maximum allowed object size." error message. What is a possible solution for this? 04. Which operation could return temporarily inconsistent results? 05. A corporate web application is deployed within an Amazon VPC, and is connected to the corporate data center via IPSec VPN. The application must authenticate against the on-premise LDAP server. Once authenticated, logged-in users can only access an S3 keyspace specific to the user. Which two approaches can satisfy the objectives? a) The application authenticates against LDAP. The application then calls the IAM Security Service to login to IAM using the LDAP credentials. The application can use the IAM temporary credentials to access the appropriate S3 bucket. b) The application authenticates against LDAP, and retrieves the name of an IAM role associated with the user. The application then calls the IAM Security Token Service to assume that IAM Role. The application can use the temporary credentials to access the appropriate S3 bucket. c) The application authenticates against IAM Security Token Service using the LDAP credentials. The application uses those temporary AWS security credentials to access the appropriate S3 bucket. d) Develop an identity broker which authenticates against LDAP, and then calls IAM Security Token Service to get IAM federated user credentials. The application calls the identity broker to get IAM federated user credentials with access to the appropriate S3 bucket. e) Develop an identity broker which authenticates against IAM Security Token Service to assume an IAM Role to get temporary AWS security credentials. The application calls the identity broker to get AWS temporary security credentials with access to the appropriate S3 bucket. 06. Your CloudFormation template launches a two-tier web application in us-east-1. When you attempt to create a development stack in us-west-1, the process fails. What could be the problem? a) The AMIs referenced in the template are not available in us-west-1. b) The IAM roles referenced in the template are not valid in us-west-1. c) Two ELB Classic Load Balancers cannot have the same Name tag. d) CloudFormation templates can be launched only in a single region. 07. What is one key difference between an Amazon EBS-backed and an instance-store backed instance? 08. You attempt to store an object in the US-STANDARD region in Amazon S3, and receive a confirmation that it has been successfully stored. You then immediately make another API call and attempt to read this object. S3 tells you that the object does not exist. What could explain this behavior? a) US-STANDARD uses eventual consistency and it can take time for an object to be readable in a bucket. b) Objects in Amazon S3 do not become visible until they are replicated to a second region. d) You exceeded the bucket object limit, and once this limit is raised the object will be visible. 10. Your application must write to an SQS queue. Your corporate security policies require that AWS credentials are always encrypted and are rotated at least once a week. How can you securely provide credentials that allow your application to write to the queue? a) Have the application fetch an access key from an Amazon S3 bucket at run time. b) Launch the application's Amazon EC2 instance with an IAM role. c) Encrypt an access key in the application source code. d) Enroll the instance in an Active Directory domain and use AD authentication.